The surnames of County Mayo. 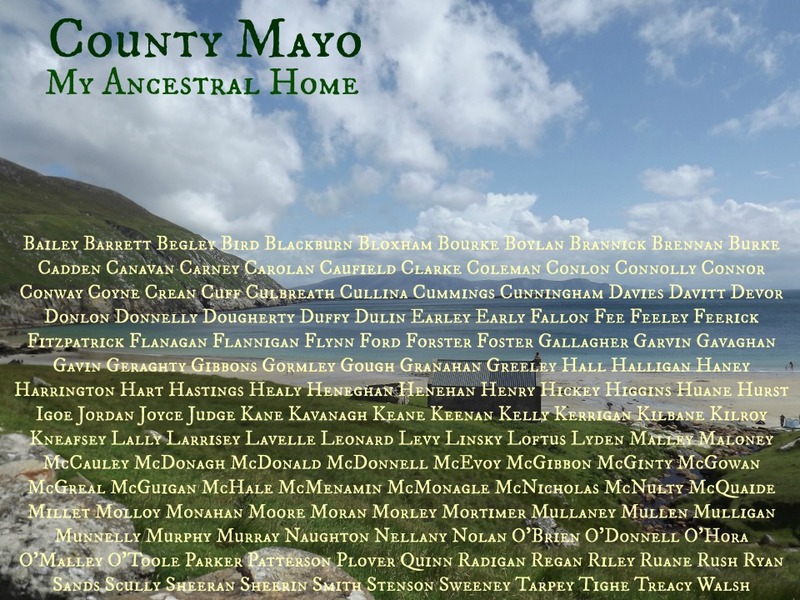 Here are the County Mayo surnames in the family trees of our Readers. Is your County Mayo surname here? If not, just let me know in the comments section below and I’ll add it. Here we see a beautiful picture of Achill Island in the sunshine – imagine that! Thats a lot of names for just one county! Don’t forget the surname Gill! Thanks! Could you please add the surname MULROY to your list. I have Family Tree on Ancestry.com and I have several ancestors from the Foxford, Straid area. My gr-gr-grandparents (Michael and Honoria MULROY) are buried in the Strade Abbey Cemetery. Don’t forget the Thomas surname. There are clusters of this surname in the Errew / Ballyheane area of Castlebar. Missing one for my family, please add Prendigast. I have many Reddington’s from Mayo. Thanks. I have Hallinan, Ferguson and Durkin. I also have a casual interest into Kneafsey. Michael Kneafsey married Margaret Hallinan, a sister of my great grandmother, Ellen Hallinan Bagley. Is the surname “Hale” from County Mayo? Hello! MARNEY can be added to your list. Thanks! Don’t forget three great Mayo names, Brett, Cunnane and Sheridan. Thanks. My ggrandmother is a Cassidy and she lived in Charlestown, County Mayo. Thanks for putting this list together. Eileen – my husband’s grandfather was Patrick Cassidy b, 1854. Family lores says he was from Mayo but I have found no records. He had 4 sisters Mary, Beatrice, Ellen and Catherine. Their parents were Patrick and Mary Doherty Cassidy. Would they be related to you? Can you please add Durkin, Hurst, McEvey, Vahey, Vahy? Thank you! Please add Gaughan and Walton. Please add Swift and Monnelly surnames. Please add Casey and Conroy. Thanks! Hello, can you add the Ludden name. My maiden name was Bermingham descending from John Richard Bermingham born in Co. Mayo around 1820. Some Trees note his father as Henry and a death certificate has his place of birth beginning with Ball which we now believe likely to be Ballinrobe He was in Australia and married Mary O’Hara, around 1849. Mary was an Irish orphan girl who went to Melbourne on the Lady Kennaway and born in Crossmolina. My ancestors include Chambers, Callaghan and more distantly Daly and Carey. These families were from County Mayo. Please add Kilcoyne from Murrevagh, Mulranny, Ireland. Also Caine from the same. Is the Baxley name a change from Bailey? Where did they originate? I’m not familiar with the name Baxley Patsy – can you tell us a little more of what you know? Mike. There are also Caseys in County Mayo, in Derry, Owenbrin, Cappaghduff District. Thank you for such tremendous research! You’re welcome Colleen. 🙂 Mike. my let name is Sullivan. it was O’Sullivan but my ancestors changed it after they came to america from county mayo. i think Sullivan should definitely be up there. I too am a Sullivan. With my Grandfather Liam Sullivan (b.1926) coming from Ballinrobe. could you add Williams,and Lane? Hickey I found they were from County Meath,Ireland.Way back in time there Williams may have been spelled differently,and Lane could of spelled different too,cause my Williams came on ship from Londonderry,Ireland,and Lane from Ulster,Ireland.Hope it was ok to send you this much out. Hi Delores – names now added! Mike. Hi Mary Ann – lots of Pattersons all around the counties of Ulster. When found in Mayo it is usually another version of the Gaelic Irish name Cussane. Mike. Please add HOPE – my ancestors from Mayo immigrated ca 1854 to Pennsylvania. Hi Eileen – added. Mike. Hi Glen – added. Mike. Please add Cafferty- from Rathmore, Crossmolina, North Mayo. My ancestor Martin was christened there in 1833. His mother’s name was Catherine Murphy – I see you already have Murphy. Thank you! Hi Catherine – I have now added your names to our list for use on future posts and articles and on Mayo! Mike. Please let us have more information on Caffertys Rathmore. wasn’t the name O’Dubhda from Mayo? or was it Sligo? Hi Marie – yes, it was originally (O’Dowd) from Sligo. Mike. We came from Mayo County in 1845 – a widow and 3 or 4 sons. Our name is McGrayel but at least three other spellings have been printed in US newspapers ( McGrail, Mc Greal, McGrayle, McGroyal). Hi Casey – I have now added your McGrayel to our list for Mayo. The different spellings can be confusing but at least all of these spellings sound the same (almost). Mike. There is a Tucker’s Lough outside of Castlebar, and a Tucker Street, in Castlebar itself. In fact, I believe the Taoiseach has his constituent office on Tucker Street. Please add the Tuckers to the list of distinguished names of Co. Mayo. Tracy – you are a source of rare and valuable information! Now added to Mayo. Mike. You can add Pue to that list! Thanks and wonderful update!! Love it! Great work to you and Carina! Enjoy your weekend and tea. Thanks Kathy – now added. Mike. Please add O’Rourke to the surnames of Co.Mayo. My gr.Grandfather came from Annagh nr. Ballyhaunis. though I believe the name originates from Leitrim/Sligo. Hi Paul – your O’Rourke now added to Mayo. O’Rourkes were originally lords of Leitrim (or as it was called Breffni). Mike. Please add KENNEDY to the list. My ancestors came from Upper & Lower Barnhill area in Lacken. I’ve hit a wall taking they back before Patrick Kennedy (born 1785) and his descendants who remained in Ireland. Hi Debby – Kennedy now on our Mayo list. Mike. The name Nestor very popular in Mayo! Galway now! and my great grandmother, Delia Grogan was born in 1873 in Ballyhaunis. My grandparents were from county Mayo. Could you add the name Hackett? Hi. Can you add the name Cawley who originally came from the inishkeas then settled in Binghamstown co mayo. Thanks. Great site! My great, great grandfather, Michael Halloran was born in County Mayo in 1836. Could he be added please? Please add Caulfield. You have Caufield, but not Caulfield. Thanks. Loftus family here. Grand Father James J (1869-1948) GG Thomas, GGGJames. Connected families, COLEMAN, FINN, MAGUIRE,. O’Sullivan, Lynch & Clarkin from Ballycurrin Demesne. I think he had brother John McTighe also came to live in Lowell. Thank you for the list of names. This may help me in researching the Connor’s and Cunningham’s. Brown .. My 5th great-grandparents (William Brown and Hannah Ann Taylor) left An Eill (now, The Neale) in 1770 for the North American colonies, traveling with their two children, who were both born in An Eill (1759 and 1762). Would you please add the Whelan family on behalf of my partner, John. He would type this himself but had a stroke 7 1/2 years ago and can’t. Thanks so much for all of your hard work and God Bless. Please add Finn. My Great grand pa x 4 Patrick Finn was born and died in Mayo County Ireland. My 3rd great grandparents were Michael Hart and Ann Calahan from County Mayo. My husband grandfather Pat Reddington had a brother Edward. Don’t no anything about him,wonder if he has any descendants. The address was, Carrowcrin, Knockanillaun, Ballina, CoMayo, Ireland. He was son of Anne Reddington. He was born abt 1885. Please add Ryder my dear mother was born in Mayo and her family still farm there. Hello Mike – my ggrandparents were Patrick and Brigid Ginley from Mayo – Dooega on Achill Island. I visited there with my grandmother in 1974 and I met a cousin – but I don’t have her contact information any longer. Any way I can track them down? Maggie, Find the number of a business on Achill island, call them and ask about your cousin. Its a small place where they all know one another. Mike. Hello l have been looking for information of my great grandfather Michael Ginley /Ginilley (had different spellings )without success. The only information l have is hewas born 1831 Castlebar & his mother was Bridget & his wife was Sarah. He died in York 1912. It would be lovely if anyone could help. McNamara is a very common name on Achill Island, Mayo. My Mother was from Achill and there is a whole lot of them!! Can I get anymore information on the Kilbane tree? I so much want to learn some so I can pass down to my children,Like My Great Granfather Edward Kilbane and my Great Grandmother cATHRINE kILBANE, mY FATHER RETIRED PIPEFITTER..My Grandmother first woman Police,I just wonder if they had brothers and sisters? Hi: My Grandfather, Patrick McFadden was from Achill and there are still decedents living there. Would you please add his last name? Thank you! The Costello family from ballyvary county mayo. My grandfather was Patrick Costello and his wife Annie, and they had 11 children. One was Thomas, my father,, born in 1912, died 1989. Patrick and Anne (Maloney) Costello are my great grandparents. My grandfather is Francis Costello. Don’t forget the Breens of Castle Street, Castlebar. Thanks! My great grandmother was Ellen Finn of county Mayo, Ireland. I don’t see Finn on the list of names. Please add the surname “GANLEY”.My grandparents and mother came from Crossard,Tooreen near Ballyhaunis. Also the name was known in Brackloon on my grandad’s side. Ganley family still strong and present in Crossard 6th generation!!!! There are many Paddens and Shevlins in the Erris area if you would add them to the list. Gaughan should be there also. In my search for my great grandmother from Mayo, I have found Mahon, Maughan, Mangan, Manghan, Moughan, Mannion, Manning. All in North East Mayo. She was called Annie McMahon in Liverpool. Her father was James, a farmer. Please add ‘Calvey’ , farmed in Cloongullaun just outside Swinford. I seem to remember the name McNulty who were neighbouring farmers. My Sullivan born family were born in the South of Mayo. Records connect them to being in Greenaun, Glensaul, Ballinrobe and other places within Ballinchalla. Also my Lydon family within the same areas. Though note you already have Lyden noted. Lynch – 3x Great grandmother Mary, from Kilmore. And her mother was a Kilboy. Can you add my last name Langan. Many Langan’s came to America from Co. Mayo in the early 1800’s. Thanks for adding Langan to our list Ann. William Lynn, John Lynn, Anthony Lynn, William Lynn 1917, there’s quite a few Lynn’s, some still alive (Noel) living there. Please add to the list? Bernard Reilly came from County Mayo to Upstate New York (Pine Valley, Catlin, Chemung, N.Y.) in about 1830, He was born about 1807 and died in 1889. He may have come with his wife Catherine. Thanks for getting in touch and sharing your Co. Mayo ancestor with us here James.